About twenty five years ago Bob, my husband, and I had a momentous telephone call out of the blue. It had such an impact that I felt I needed to record the event. When retirement came along there was time to fill and the thought came to add to what I had written five years before. Having added to the original, it was shelved again as life became too busy. Bob’s health then began to deteriorate and alongside the process of learning to be a full-time nurse, I started writing again, adding more stories of our life together. Two years ago, after his passing, I moved back across the world from New Zealand to United Kingdom and one day happened to pick up a local paper. There, inside, was a small advertisement about a writers surgery to be held in our local library. “Yes” I thought. I had a finished manuscript and was wondering what to do with it, so thought that this could point me in the right direction. The last six months have involved lots of rewriting, finding an editor, learning about the publishing process, developing an on-line book and finally, in February 2014, I self published to Kindle and in hard copy format. 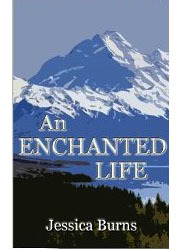 Given the autobiographical nature of my book “An Enchanted Life“, people I talk to about it often have lots of questions; “what are you doing nowadays?”, “any more plans to travel?”, what are you writing now?” So I thought a blog would be a useful way to keep writing about my ongoing adventures and keep in touch with my audience.